Summer is over. I just need to accept this fact. Oh, sure, the Official Last Day Of Summer is on the autumnal equinox on September 23rd. However, all of the signs point to summer being over now. First of all, the kids are back in school. While this is a welcome sign for many parents, it also heralds the beginning of the fall months. No more coming home and taking the boys to the water park to cool off. In fact, if they are even still open (something I would doubt), going into the water in the recent weather would not be something I would encourage. Thanks to the weather, we have our third sign: The trees are changing colors. Yes, the green leaves are still the most common, but other colors are rearing their ugly (ok, beautiful) heads. Some trees have even begun to lose their leaves! A more local sign is Hoffman’s closing. Hoffman’s is a local amusement park that generations have grown up attending. This is the time of year when it normally closes for the season. Sadly, it has closed for good. Soon the rides will be sold off and the area redeveloped as retail shops. A local spot for families to go to enjoy some nice rides will be just another shopping area. Future summers just won’t be the same. 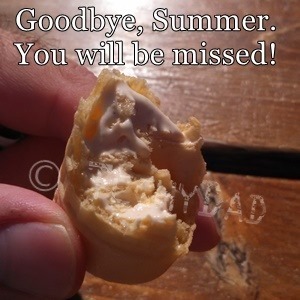 Lastly, we realized that one of our favorite local ice cream shops was closing today. We hurried on over to enjoy a final cup or cone while watching their cows. Yes, summer is over. Soon the leaves will fall, the air will turn cold, and perhaps snow will even fall. Thank you, summer for all of your warm days and fun memories. You will be missed. As much as I hate seeing summer go I love the fall. There is something about the changing of the seasons whether its spring or fall. Maybe its the anticipation of the uncertainty that winter and summer bring us.